About 3 in 4 American workers feel that they have more work-related stress than their counterparts of a generation ago, and almost half of all workers say that their family lives are worse off today. In his new book, 'The Road to Gumption: Using Your Inner Courage to Balance Your Work and Personal Life,' consultant and author Gary Lim reveals keys to making changes that can turn this around. Figuring out what to change in your life, if you change anything at all, is daunting. I hope 'The Road to Gumption' gives readers the gumption to go down that path and find better balance in their lives. 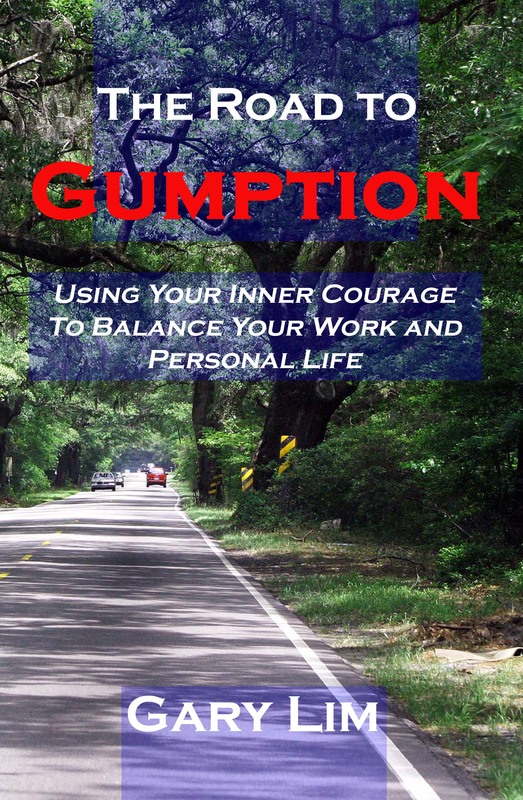 A new book, The Road to Gumption: Using Your Inner Courage to Balance Your Work and Personal Life (Dorato Press, ISBN 1847289681), offers a methodology for overworked, overstressed workers to create more balance between their work and personal life priorities. According to a survey released on Labor Day 2006 by the Pew Research Center, 71 percent of American workers feel that they have more on-the-job stress today than workers did 20 or 30 years ago. And 45 percent feel that the quality of their family life is headed in the wrong direction. Most feel that something needs to change, but few know where to begin to consider what that change might involve, or if it's even possible. Author and consultant Gary Lim, M.A. has written a parable in which the main character grapples with this dilemma. By the end of this fictional story, readers become familiar with Lim's '11 Rules of Gumption' and 'The 5 P's of Change', offering a framework to consider one's own situation and to formulate a plan for change. Though the parable is told from the perspective of balancing work and personal life priorities, 'The Road to Gumption: Using Your Inner Courage to Balance Your Work and Personal Life' is really a story about creating change in many different situations. Lim's 5 P's of Change and the 11 Rules of Gumption are applicable to almost any business or personal situation where change is needed or desired. "I wanted to write a book that is a quick read, has memorable take-aways, and offers a method that would allow readers to begin the process of evaluating change in their lives," said Lim. "Figuring out what to change in your life, if you change anything at all, is daunting. I hope 'The Road to Gumption' gives readers the gumption to go down that path and find better balance in their lives." The author also offers several seminar formats based on his book. A public seminar, called Weekend of Gumption, is offered in select cities nationally over weekend dates. These seminars limit the number of attendees to maximize the personal attention that each person or couple receives from Lim. Custom seminars can be quoted for larger groups, organizations, and corporate settings. There is also a business-oriented custom seminar entitled The Road to Business Gumption: Creating Change in Your Organization, in which Lim applies the Rules of Gumption and The 5 P's of Change directly to a firm's business issues and priorities to help create a culture of change. 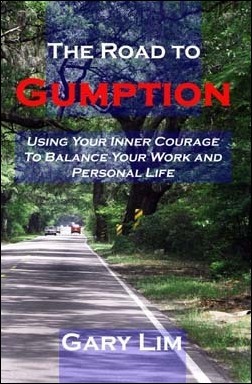 The Road to Gumption: Using Your Inner Courage to Balance Your Work and Personal Life is available at Amazon.com, Barnes & Noble (bn.com), and other online retailers. It has already attained Amazon Top 50 'bestseller' status in the Business/Health & Stress category. Gary Lim, M.A., is an entrepreneur, consultant, author, and speaker. He is founder and President of Aurarius LLC, a strategic and management consulting firm located in Manlius, New York. He also founded CEO PrivateLine, and is co-founder of HealthcareBusinessOffice LLC. Lim's experience and skill set are focused in the areas of helping companies, organizations, and individuals achieve even higher levels of performance and results. Road to Gumption front coverFront cover image of the new book The Road to Gumption.